The new globe valve actuators. Versatile, intuitive, safe. 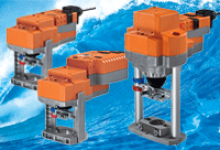 Based on the technology that has already proven itself in rotary actuators a million times over, Belimo is now bringing a new generation of globe valve actuators on the market to round off the comprehensively standardised actuator concept. In order to extend the range of possible applications further and to meet real market requirements, the product range has been extended both upwards and downwards to include a power spectrum ranging from 500 to 4500 N – naturally in the accustomed reliable Belimo quality. The more compact construction permits the installation of stationary heating, ventilation and air-conditioning systems with critical space requirements. The new product range is distinguished by simple and intuitive handling from the mechanical coupling to the setting of parameters.